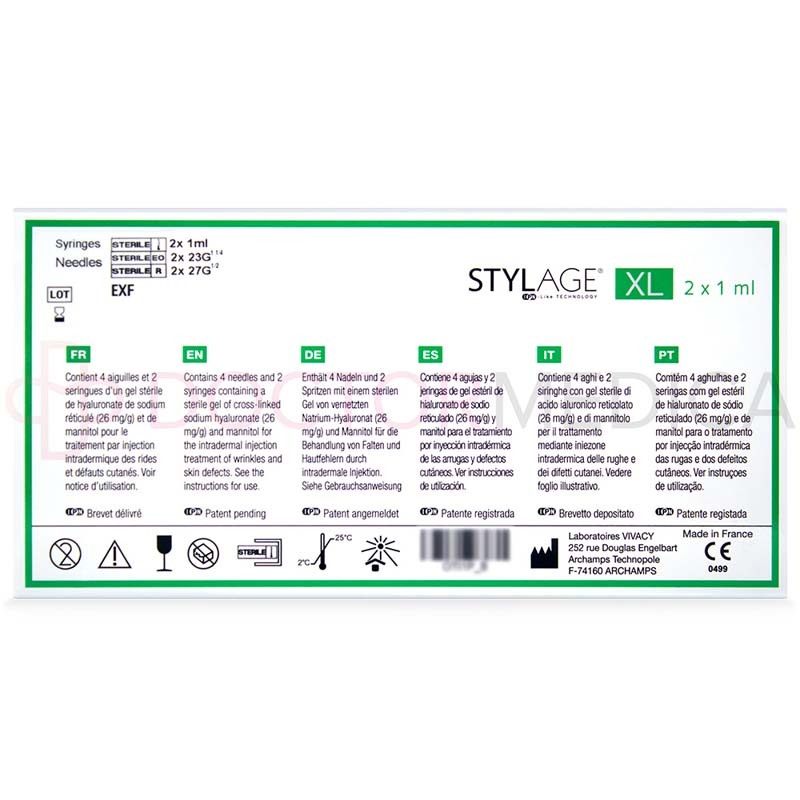 Stylage XL is an injectable dermal filler made of biodegradable, non-animal derived, cross-linked hyaluronic acid and mannitol—available for purchase at DoctorMedica.co. It is indicated for facial contouring and volume restoration. You can order through our website by registering for an account. Call our dedicated customer service team for assistance. Each Stylage XL package comes with 2-1ml prefilled syringes, 4 single-use needles, and the product insert. Store in its original packaging between 2℃ and 25℃. Freezing is not recommended for this product. 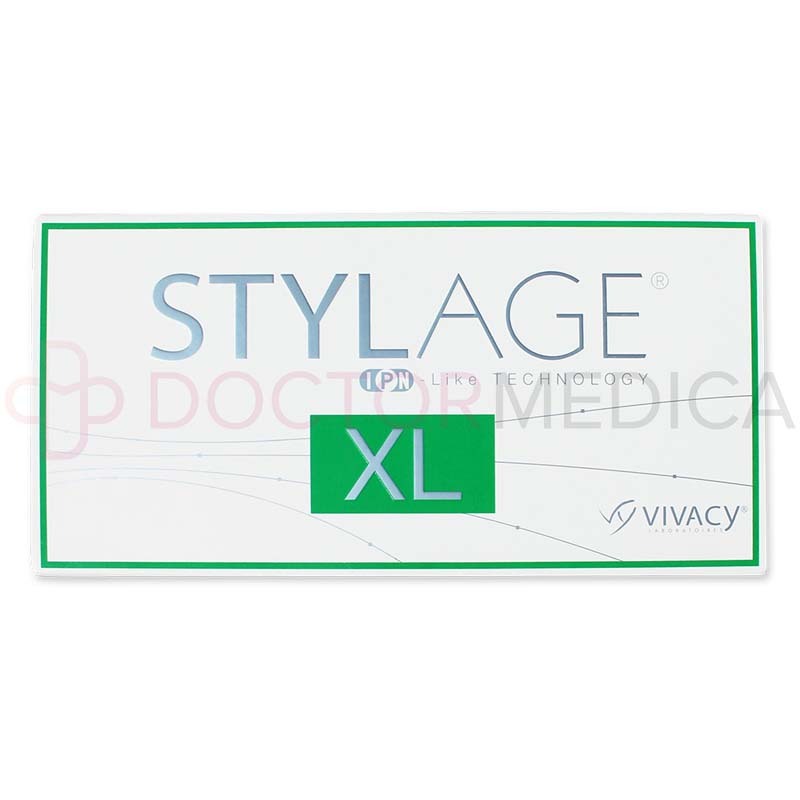 Stylage XL is a volumizing dermal filler, containing cross-linked hyaluronic acid created using IPN-Like Technology. It has high malleability and pseudo plasticity—an extraordinary ability that enables it to adapt to the movements of skin tissues without migrating to other non-treated areas. Stylage XL contains 26mg/g sodium hyaluronate (BDDE), mannitol, and phosphate buffer pH 7.2. The active ingredient in Stylage XL works wonders by correcting facial volume defects, restoring the contours of the face, augmenting the cheekbone area, and rejuvenating the backs of the hands. The HA used in this filler is bioabsorbable. Its unique formulation balances the needs of the skin by providing hydration, tone, and elasticity. By filling the depressions in the dermis, the skin’s surface becomes smoother, hollow areas appear plumper, and facial structures are well defined. Strictly adhere to an asepsis procedure before starting the injection. 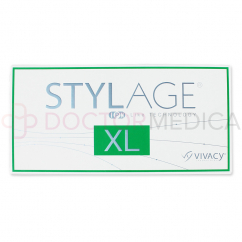 Inject Stylage XL slowly into the deep dermis, up to the subcutaneous layer of the skin. Insert the needle at a 30° angle using the fan-shaped retrograde injection or linear retro-tracing technique. Do not inject the implant in the periorbital and glabellar region of the face. 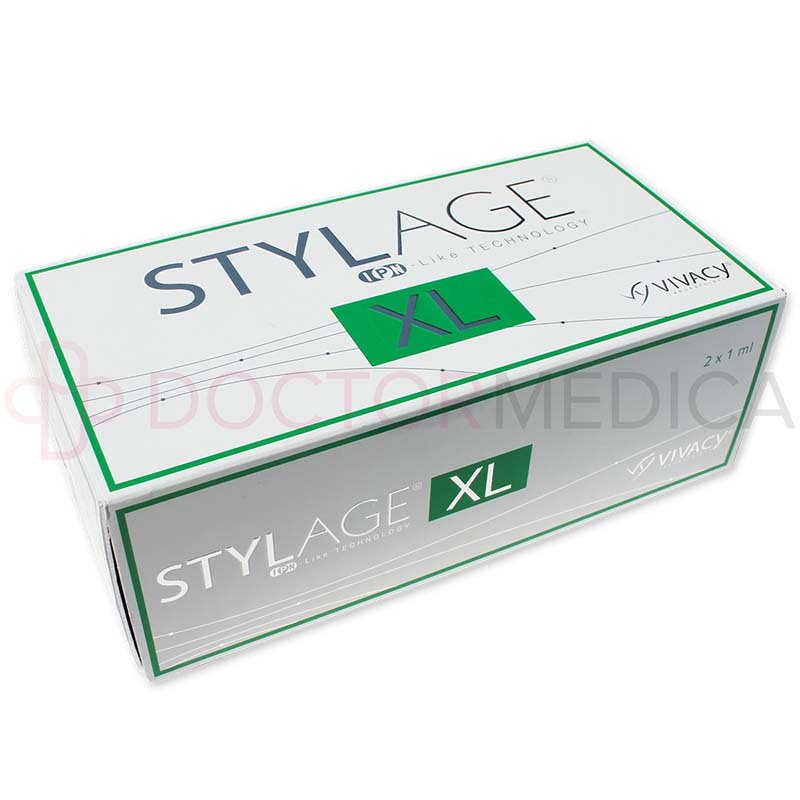 Administration of Stylage XL is a simple procedure that can be performed in your office, without the need for hospital confinement or other comprehensive diagnostic tests. It’s even safe to forego skin testing or allergy testing since the product is made of non-animal HA. The procedure may last between 15–30 minutes. Use Stylage XL to rebalance the volume of the face including lipodystrophy, correct facial contours or facial defects such as ptosis, lift facial creases, and rejuvenate the backs of the hands. This innovative, antioxidant-containing product also helps boost skin moisture, and tighten sagging skin. 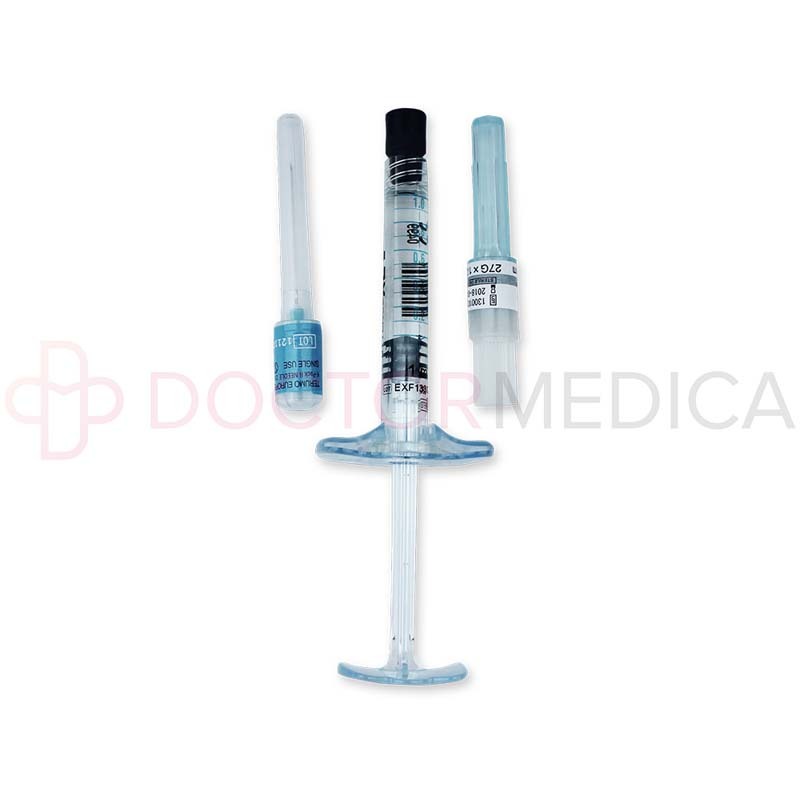 This injectable filler can be used in various facial areas that need augmenting or contouring, such as the patient’s cheeks and cheekbones, areas affected by deep wrinkles and creases, and other hollow areas of the face, as well as the backs of the hands. The incredible efficacy of hyaluronic acid in Stylage XL is further enhanced by the additional mannitol. This unique combination provides long-lasting results of up to 12 months or more. The normal aging process comes with significant volume loss, loss of elasticity, and wrinkles. Continued damage to the skin results to loss of radiance that makes the skin appear older. By filling the gaps within the skin and restoring volume in hollow areas of the face, you can dramatically transform your patient’s facial appearance. Patients suffering from facial lipodystrophy, slight ptosis, and other facial volume defects will have a great chance to improve their appearance and enhance their self-esteem. Order this product now if you want to give safe, effective, and immediate results to your patients. Stylage XL injectable is recommended by medical professionals worldwide in treating patients suffering from facial abnormalities, such as sagging, lack of volume, disproportionate facial contours, and less defined features. Reported side effects in using this cosmetic filler may include erythema, itching, pain, and swelling. These transient effects will resolve within a couple of days. The complete list of side effects and complications can be found in the product insert. Discuss the treatment process, adverse effects, precautions, and contraindications with your patients prior to injection.